We spotted this beauty moving slowly through the bushes in Mantadia National Park in Madagascar. After holding him up for pictures and measurements we let him on his way. 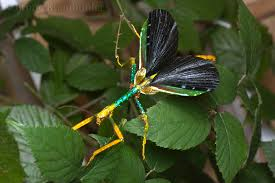 The male Achrioptera punctipes Stick Insect is a vibrantly colored, large insect that sways like a leaf in the breeze when it is on the move. Not only is it colored like a carnival float, it has incredible black tipped spines on its abdomen that look nasty, but are not! Luckily these beautiful creatures are docile and easily handled. Females are 20 to 22 cm long, the males who are the colorful ones measure approximately 13 to 14 cm long. These are incredibly fun and easy to keep requiring a small area to live and fresh leaves to eat. They are fond of English Ivy, Berry vines (Bramble), Privet, and Hawthorne to name a few. We offer Ova and Nymphs at various times so please inquire as to which you are interested in.